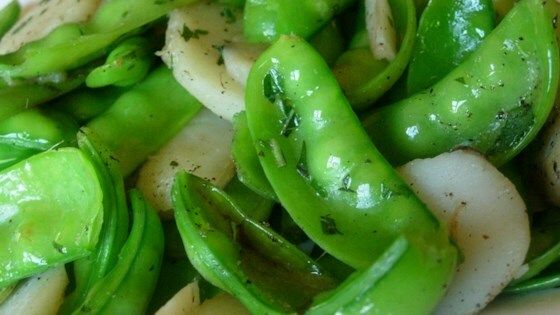 "Snow peas with water chestnuts, sesame seeds, and mint. This is quick and easy, yet good enough for company." Heat the olive oil in a large skillet over medium-high heat. Stir in the snow peas, and cook for 2 minutes, then add the water chestnuts, mint, and sesame seeds. Cook and stir until the snow peas are tender, and the water chestnuts are hot, about 3 minutes longer. Season to taste with salt and pepper before serving. Sorry but I didn't care much for this one. I think too much sesame flavor. I did like the mint, though. This recipe is a great way to jazz up a side dish. My husband and I really liked the combined flavors of all the ingreadients. We couldn't really taste the mint. Prehaps fresh mint rather than dried would have made a difference. We liked this very much and I'll def make it again.